The Max ER1500 employee time clock is manufactured in Japan by the Max Corporation, they have a range of two employee time clocks, the Max ER1500 and the Max ER2200-PC. The Max Corporation produce very reliable products that just last forever and are extremely good value. This particular employee time clock machine has a fully automatic clock card feed/eject operation and is guaranteed not to over stamp on a previous clocking. The Max ER1500 has the ability to calculate the elapsed time between clocking’s, this calculation feature may be turned off. You may also program core time so that the time clock will print a tardy/lateness symbol if an employee clocks in late or out early. It can accommodate four clocking’s per day, if the time card calculation feature is turned on the fifth column is used for the daily total. 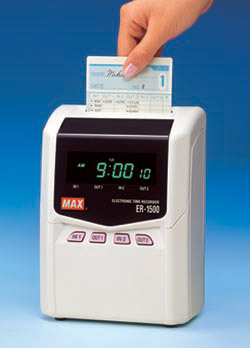 The Max ER1500 is a very popular time clock that uses its own unique clock card, and is suitable for all types of working environments from shop floor to office.